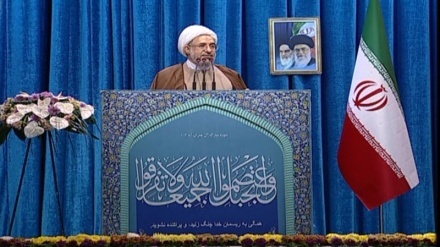 Senior Iranian cleric in a speech in Tehran's Friday Prayers said, Muslim people around the world should be united to strike a heavy blow to the US. 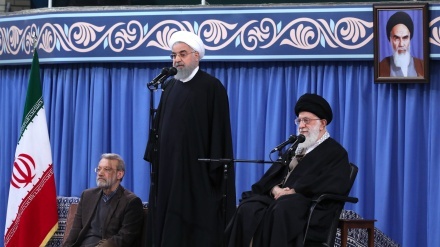 Iran Press/ Iran: Tehran's Provisional Friday Prayers Leader Ayatollah Seyed Ahmad Khatami in his second Friday prayers sermon, referring to the beginning of Islamic Unity Week (November 24-26) celebrations, called for unity among followers of various religions in Iran and the world. The cleric rejected the US president "Donald Trump" claims against the Iranian nation and added that Trump himself deserves to be called a terrorist, Iran Press reported. Addressing thousands of worshipers, he pointed to the US' role in creation of terrorist groups in various parts of the world including Syria and said, "Washington and its allies including Saudi Arabia are behind spread of terrorism in the region. Commenting on the deteriorating situation in Yemen, the cleric urged the international bodies to put pressure on the US instead of issuing non-binding statements. "However, the people of Yemen are the winner", he said.